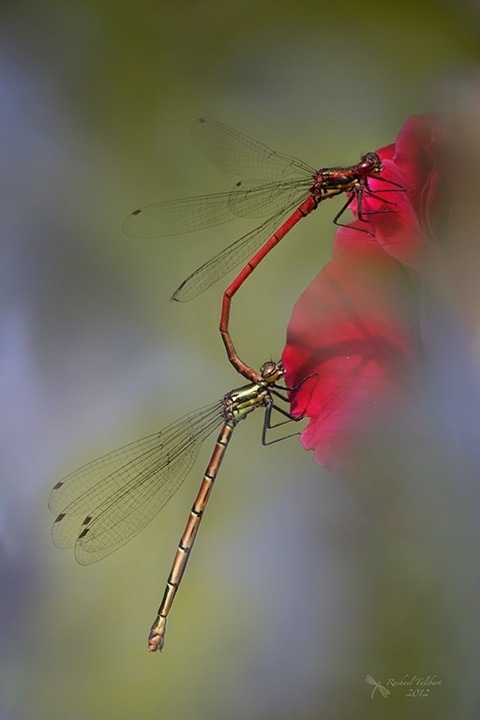 A male damselfly holds onto the female after mating to prevent other males from inseminating her. Taken in my garden this week. Every charm to nature owing. This entry was posted in garden, nature, photography and tagged damselflies, garden, insects, large red damselflies, macro, nature, photograph, photography, wildlife by Rachael. Bookmark the permalink. I love this. The detail in the wings even stands out. This is great! Thanks. We have seen a few of these in our garden this year. Someone nearby must have installed a pond. Gorgeousness Rachael.. I love the colour. Did you turn the photo 90 degrees or was this the way you took it? They always hang like this. It is as taken. This is incredible!!! Lovely photo! Thank you. I am so glad you like it. Thanks, Tricia. I am pleased to have found a few of these in our garden this year. Wow. You’re a very talented photographer. Going to follow your blog and hopefully learn by osmosis. Yes, great colours here. I suspect your insect pets (sic) are starting to tolerate you. Ooh lucky you, what a great find in your garden! Wonderful colours. I think someone nearby must have installed a pond as I have never seen damselflies in my garden before.